Our team has come up with some greatly engaging social studies worksheets, incorporating all the essential areas like history, civics and geography. To ensure it rightly caters to the children's varied requirements, we have further sorted the worksheets into as many easy-to-follow categories as possible. Beat the Continent Monster in style, and smile your way through the topic. While you browse through our continents worksheets and activities, the top pick of which are continent facts, flashcards, choose and label the continents, complete the legend, riddles, and fill in the blanks, you will find that every detail matters as there is something new yet crucial in store. Have you ever observed the coins? 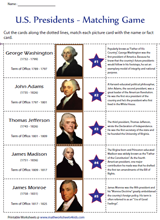 Do you know what each color in the American flag signifies? 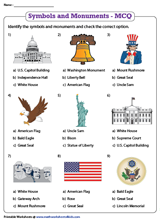 Add-on to your knowledge with this collection of American Symbols worksheets, activities, charts, coloring pages, reading comprehensions and much more! 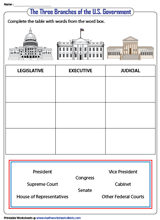 Know the 45 American Presidents a little more with this compilation of worksheets featuring charts and ample activities like identifying, labeling, matching, memory game, crossword, quiz, MCQ on presidential facts and firsts to mention just a few. What are your rights? Who drafted the Constitution? Find answers to these and many such queries with the U.S. Constitution worksheets comprising the Bill of Rights, Preamble, 3 branches of the government, reading comprehensions and more. Figure out how America was colonized with this compilation of thirteen colonies worksheets, maps and chart. Locate, label and color the colonies and the three colonial regions on a map, compare the American colonies, name their capitals and founders, learn about the jobs in the 13 original colonies and more. The earth fascinates with a diversity of landforms. Walk through this host of printable worksheets, including identifying and labeling landforms and bodies of water, cut and paste, vocabulary charts, and many more for kids of grade 1 through grade 4. Do you feel sprightly when it is sunny and bright, or are you down in the dumps, when it is raining? With our weather worksheets, we take kids on a pleasure trip through activities like weather word search, dressing up for the weather, identifying the weather instruments and the fun never ends. Doesn't the Sun, with its inexhaustible splendor, ask you forthright questions, which defy your wits? 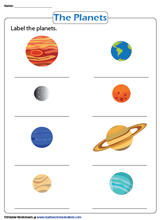 In this set of solar system worksheets, kids learn topics like the heavenly bodies, the eight planets, space vocabulary, planet fun facts and so on and so forth.